12inch / 30.4cm latex balloons. Balloons come in packs of 72, and in your choice of either white or clear. 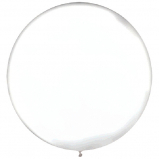 24 inch /60.9 centimeter round latex balloon. Balloons come in packs of 4.